Raised in the late 1700s by Mr Shepherd of Uckfield and originally named Shepherd’s Pippin. It was renamed Alfristonin 1819 by Mr Booker who lived in that village. It received an RHS Award of Merit in 1920. Currently cultivated as part of Brighton Permaculture Trust’s National Collection in Stanmer Park, Brighton. 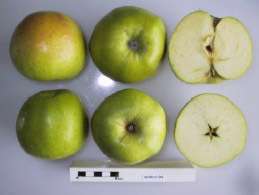 The Alfriston apple is medium to large in size and bright green or greenish yellow with conspicuous white dots (lenticels) on the skin of the fruit. Its shape is oblong with a flat base and rounded apex. Basin broad, deep. Ribbed. Eye large, partly open. Sepals broad base. Cavity quite broad, quite deep, russet lined. Stalk short & thick. Alfriston is quite a sharp cooking apple that cooks to a lightly flavoured puree and is very good baked. “It was much recommended and planted in the last century, when it proved to be one of the best culinary apples of the time. Now it is superseded by varieties more regular in outline and more handsome to the eye, though none is better for cooking,” wrote HV Taylor in 1948. Fruit can be picked in early October. It stores well and can keep till April. The tree is moderately vigorous.